… will never resolve or end anything, except life! Shifting to Know your/our interconnection, Oneness, eliminates fear and hate. 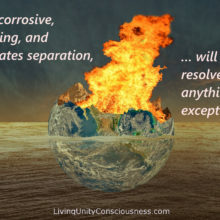 In our innate Oneness we shall thrive, in Separation we destroy … you choose!